automobile and motorcycles. 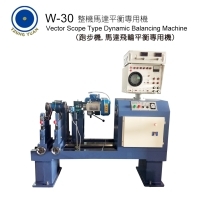 Customized balacing machine.MIT! ． Cathode-ray tube (CRT) clearly displays unbalanced vectors on the monitor. Note: New model uses 22” flat-screen color display. ． IC memory device indicates the unbalanced vectors when test objects stop rotating. ． Broad rpm test range: 200-20,000 rpm (at variable speeds). ． The tachometer indicates balancing speed at the same time. ． Sensitive auto-tracking wave filter will not be affected by any rpm change. ． This ultra-precision unit is designed for the testing of vibration displacement below 1 micron. ． Users can select proper drive methods for different test objects; belt drive, joint drive, or self turning. ． When calculating circuit is set to work, the compensation circuit will offset the imbalance of the test objects. ． No more manual calculating during tests. ． Highly sensitive integrated circuit (IC) ensures stability of this unit under long-term applications.